Watching Harold Pinterís starring performance in his own play The Hothouse, you realise that we lost a magnificent comic actor when this former denizen of tatty reps transformed himself into Britainís greatest living dramatist. The play itself reinforces the impression of recent years that, although Pinterís pause-filled plays undoubtedly are menacing, enigmatic, and all the other adjectives associated with that handy word Pinteresque, he is, perhaps above all else, a wonderfully funny writer. I have a hunch that while he was establishing his reputation as Ýan important dramatist, Pinter and his directors deliberately played down his gift for gags, concentrating instead on all that was murky, avant-garde and unsettling in his work. Which might be one reason why The Hothouse took so long to see the light of day. He wrote it in 1958, shortly after The Birthday Party, but then put it aside for more than 20 years before giving his permission for a 1980 production at Hampstead, which transferred to the West End. Of course, this welcome revival has its serious side. 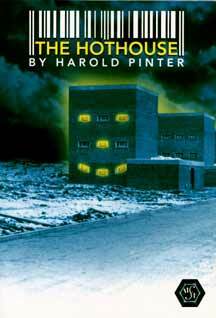 It is set in a sinister state institution, the precise function of which is never quite explained. The inmates ñ whom we never meet - are described as patients and referred to by numbers; thereís an interrogation scene involving electrodes and white noise; and at the end we learn that all the senior staff have been massacred by the residents. It's impossible not to think of the psychiatric hospitals in which totalitarian states lock up their dissidents. Pinterís paranoid vision of malign government control had become familiar to the point of clichÈ in the years since the play was written. What keeps the piece fresh is edgy, brilliantly timed dialogue, its confrontations between characters as they battle for territory and control and its unashamed relish for jokes. You may find this hard to credit, but in The Hothouse Pinter works the old exploding cigar routine, not to mention a heroically awful joke based on the phrase ëfor the love of Mikeí which might give an end-of-the-pier comedian second thoughts. 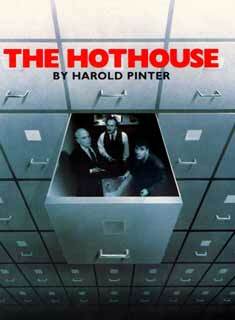 Pinter himself is in glorious form as Colonel Roote, who runs the institution. This bristly-moustached character ñ prone to sudden intemperate rages, rather like the famously testy playwright himself ñ is having a terrible Christmas Day. One of the inmates has died, and another has given birth, with the suggestion that Roote might be the father. Basil Fawlty and Captain Mainwaring come to mind as Pinter blusters, bullies, submits grotesquely to flattery and gradually lays bare an authority figure that is losing control. The smiling menace with which he inquires, ëBetween ourselves, man to man, youíre not by any chance taking the old wee-wee out of me, are you?í is alone worth the price of admission. The supporting performances are impeccable. John Shrapnel is superb as a blank-faced, creepy functionary; Celia Imrie is a slinky, smilingly manipulative femme fatale; and Tony Haygarth is hilarious as the insolent slob who rattles Roote. David Jonesís production, ingeniously designed by Eileen Diss, never relaxes its grip and there is a splendidly unsettling soundtrack (Tom Lehman) featuring the whimpers and diabolical laughter of the inmates. Itís a memorable evening of menace-fuelled mirth, and Pinter, for so long suspected of ingrained solemnity, must surely be a candidate for the comedy performance of the year award. 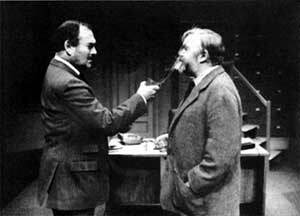 One of the most remarkable things about seeing Harold Pinter act in his own plays is that they generally brood much less when he is around. The eloquent pauses and significant obliquenesses are all in place, but Pinter understands the extent of the comedy of his work. Not that humour is difficult to spot in The Hothouse, which he wrote in 1958 but ëset asideí until 1980, and now transfers from Chichesterís Minerva Studio in David Jonesís fine production. The shadows are all cast by the scheme of the play rather than its execution. The setting of an undefined ërest homeí in which the inmates, known only by numbers, are routinely abused and electronically tortured by staff whilst the man in charge blusters inanely and his subordinates jostle one another for the succession, offers pre-echoes of One For The Road and Mountain Language. Yet the actual script is less suggestive of Orwell or Kafka than of Orton. As Roote, the ineffectual, pompous ëchiefí, Pinter sports both a moustache and a manner reminiscent of Dadís Armyís Captain Mainwaring. He makes an excellent self-important, retired colonel, unable to string a sentence together at the best of times and gradually subsiding into a whiskey haze while his accent becomes broader and more plebeian. Rooteís assistants, Giggs and Lush, are played with equal finesse by John Shrapnel and Tony Haygarth. Shrapnel is a master of arid assiduity, his face a careful blank but seemingly emitting a whir of the turning cogs of a Machiavellian scheme. Haygarthís Lush is sly, insinuating, greased with self-satisfaction as he riles his superior, accusing him of impregnating patient 6459 and murdering 6457. Lush is the agent of two moments of unimaginably broad un-Pinterian comedy. Having twice had whiskey flung in his face for these allegations, the third time he grabs Rooteís tumbler and twirls it above his head in a galumphing balletic parody ñ later extracting Roote with an exploding cigar. The mind boggles that Pinter ever wrote such slap-stick, let alone between The Birthday Party and The Caretaker. As Miss Cutts, mistress of both Roote and Gibbs, Celia Imrie wears a permanent cool smirk, obviously playing her own game throughout. Christien Anholt is all naove idealism as Lamb, who is ultimately sacrificed amid the electrodes of ënumber one interviewing roomí. Even here the gags persist, as the disembodied voices of Gibbs and Cutts hector him, ëHave you always been virgo intacta?í and ëWhat is the law of the wolf pack?íThe play itself lacks a little polish: introducing an entirely new character for the final five-minute scene smells of dramatic desperation. In the end, though, its successes are much more surprising than its flaws. On this occasion, Pinterís famous ëweasel under the cocktail cabinetí is wearing a red nose and clownís baggy trousers.